Discount vessel sinks save money on a bathroom remodeling job. Whether you're renovating your entire bathroom or just the sink area, saving on the sink gives you more money for other areas of the budget. In difficult economic times, many homeowners choose to make renovations to their current residence when they might otherwise move to a new home. Saving money is always a concern, particularly with home improvement projects. Like so many other home furnishings, the price tags that accompany vessel sinks vary greatly. There are ways to save money on vessel sinks so you don't have to compromise on style. Choose a discontinued vessel sink from an online retailer or a local home improvement store. Discontinued models are generally in perfect condition but are being replaced with new styles. You can take advantage of this and save money on the purchase. Look for vessel sinks with slight blemishes. Even small imperfections usually send a vessel sink to the clearance section of the home improvement retailer. If you're the type of person who will obsess over the imperfection, this option probably isn't for you. Visit your local Habitat for Humanity ReStore. They sell donated home improvement products with the profits benefiting local Habitat for Humanity projects. The prices are generally significantly lower than a retail store. If you're lucky, you might come across a vessel sink. If your project isn't urgent, visit the ReStore frequently and you might catch a vessel sink. Look for a clearance section on your favorite bathroom or home goods supply website. Like the clearance section in an actual home improvement store, you're likely to find vessel sinks that are either discontinued or slightly damaged. Watch for a used vessel sink on Craigslist or local newspaper advertisements. As long as the sink is in good shape, there's no reason why you shouldn't enjoy the cost savings on a used vessel sink. Local retailers: Most home improvement stores carry a selection of vessel sinks. Watch the advertisements for good discounts on the sinks. Also watch the clearance section for damaged or discontinued sinks. Occasionally, you might find a vessel sink that was purchased and returned. Returned items are also usually offered at a discount. Bathroom Vessel Sinks: This website has a section devoted to clearance and discount vessel sinks. Discount Bathroom Vanities: Here you'll find discounts on different bathroom fixtures, including vessel sinks. 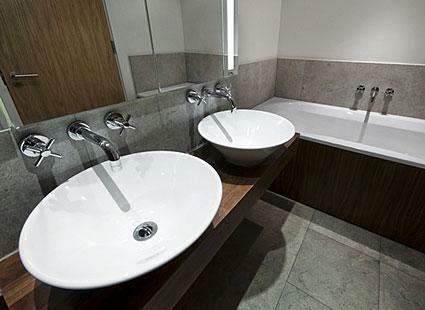 They have a wide selection of vessel sinks made from different materials. The Bath Outlet: This site also offers free shipping on its sinks. It has a variety of sink styles including some vessel sinks. Discount vessel sinks give you the look you want in your bathroom without breaking your remodeling budget. There are several options for saving money on vessel sinks depending on how much you're willing to compromise.